Favourite deodorant to date. I've decided to do this one first as I couldn't actually wait to rave to you all about it. 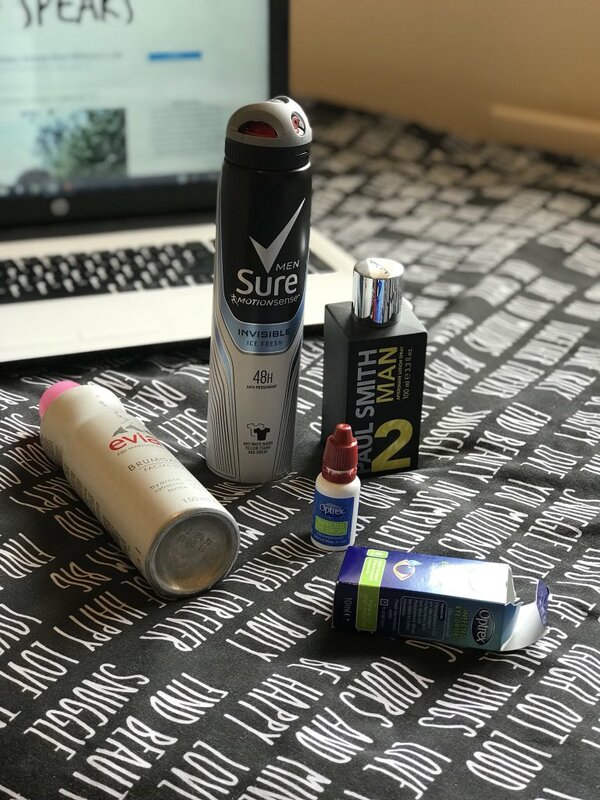 It is best deodorant I've ever brought and Sure has never let me down, I've always reached for Sure products as I've always used them and always trusted them. The Invisible Ice Deodorant also comes with MotionSense technology which gives you guaranteed freshness for longer and I am LIVING for it. I'm not gonna lie but I didn't know 'facial sprays' existed until I discovered this product about a year ago. It's a genius idea, yes the cool sensation doesn't last long but you could use it all day if you wanted to! My 'do it yourself' idea for this product is to get a squirty bottle and just fill it up with water then you wouldn't be as sparing with the product because you could just fill it back up whenever you wanted! I can't be the only one that has a holiday scent? This Spray smells a-ma-zing. I've received so many compliments about this aftershave product that it would be wrong not to include it in this post. Yes I am a sufferer and always have been for as long as I can remember. Absolute agony and one of the main reasons why I am not a 'sun boy'. However, since using these eye drops every so often when I'm out and about in pollinated areas I have been pleasantly surprised and I have never tried anything like this product. I have been to my GP many times and tried many different nasal sprays, tablets and drops but nothing has worked better than these eye drops. 10/10 recommend! Disclaimer: This post is NOT sponsored but links in this post are affiliate links, which means I receive a percentage of the revenue made from purchasing products through the links placed on my blog. This does not affect you as the consumer OR the price of the product.